Chesterfield were left heartbroken as Charlton substitute Lee Novak handed them their six successive defeat. Super sub Novak netted a late winner just five minutes after being introduced at the Valley. Four changes were the course of action for Danny Wilson after last week’s drubbing against league leaders Scunthorpe United. Ian Evatt, Dan Gardner, Connor Dimaio and Liam Graham all came in to the starting line-up at the expense of Tom Anderson, Jon Nolan, Jay O’Shea and Ricky German whilst Krystian Dennis was fit enough to return to the bench. 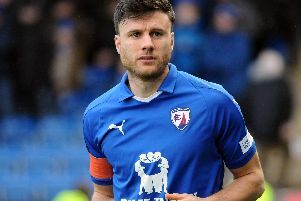 The Spireites set up in a 5-2-2-1 formation as they looked to stop the rot of five defeats on the bounce in all competitions. Both sides had chances during a frantic first-half, but neither managed to break the deadlock. Josh Magennis was the biggest threat to the visitors. Early on he weaved his way into a good position in the box, to get on the end of Morgan Fox’s cross, before flicking his shot wide. Ched Evans was picked out perfectly but could only half get his shot away, into Declan Rudd’s body, after failing to control the pass. Before the half an hour mark Gardner almost repaid the faith shown in him by Wilson as he left the post rattling with his curling effort. Down the other end Nicky Ajose also hit the woodwork after leaving Ryan Fulton helpless after being played in behind. Mere minutes before the break Fulton’s height came to his advantage as he produced a sublime stop to keep out Magennis’ goal-bound header. Wilson’s men looked content to hold on for a point as they kept men behind the ball after the restart. The menacing Magennis kept going close and on the stroke of the hour he had a couple of chances. First he flashed a header wide before heading a second straight at Fulton as the Addicks upped the ante. Magennis found the back of the net 16 minutes from time but the referee had already called play back for a foul on Fulton. A minute later Jordan Botaka put the ball on a plate for Ajose, who headed wide with the goal gaping from an unmarked position. That was Ajose’s last touch of the game as Novak came on and within minutes he stole the spoils as he turned home Ricky Holmes’ cross. In stoppage time O’Shea almost grabbed a point but his shot was deflected wide. Charlton: Rudd, Solly, Pearce, Bauer, Fox, Holmes, Crofts, Ulvestad, Lookman (Botaka 70), Magennis, Ajose (Novak 81). Unsued subs: Phillips, Foley, Lennon, Konsa, Jackson. Chesterfield: Fulton, Donohue, Hird, Evatt, Graham (Dennis 88), Gardner (O’Shea 65), Liddle, O’Neil, Dimaio, Ariyibi, Evans (German 88). Unused subs: Mitchell, Nolan, Allinson, Maguire.